Below are the locations of the Heaston and Scarborough families in Doniphan County, Kansas, who had moved there from Ohio. This has been of interest to me as Isabel McKenney was said to be Ioway and these families located on and next the Ioway reserve, along with others from the same area, this after Isabel having married George W. McKenney and being found in Ohio with him in 1850. The Scarboroughs moved later. Mark Scarborough’s sister, Rhoda, was married in 1835 to another George W. McKenney b. 1816 who would have been a close relation of our George W. McKenney Sr., but was not his father. Mark Scarborough b. 1808 in Belmont, Ohio, moved with his family to Jefferson, Andrew County, Missouri, via Indiana, by 1859. Mark’s sibling, Rhoda, and her husband George W. McKenney b. 1816, had also moved to Missouri and were living in Haw Creek, Morgan County with son Francis and his new wife, Barbara Miller. Francis reported in his bio that he and his wife were traveling through the Missouri frontier looking for a place to live. They settled in Indiana, where, as with the Mark Scarborough family, they had also been living just previous the move to Missouri. By 1865 the Mark Scarborough family was at Iowa, Doniphan, Kansas. In 1870 and 1880 they are at Center, Doniphan, Kansas. Jacob G. Heaston b. 180 in PA married Catherine Forney. In 1840 they were living near the Sheaffers/Shaffers in Harrison County, Ohio. By the late 1840s the Sheaffers/Shaffers and Bartows (related, Mary Bartow married Robert Eugene McKenney and Jeremiah Shaffer married Elizabeth Bartow) and most of the McKenneys had moved to Iowa. In 1850 the Heastons were still in Harrison County, Ohio, but by 1851 are said to have been in Holt County, Missouri. 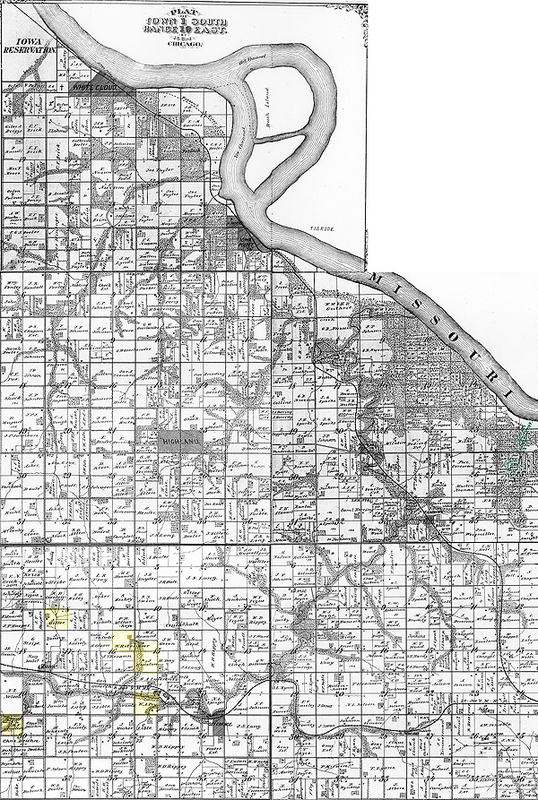 By 1857 they were residing on a homestead in the southwest quarter of section 15, Wolf River township, in Doniphan County, Kansas, other members of the Forney family locating instead on the Great Nemaha Reserve in Nebraska. Source Citation: Year: 1860; Census Place: Wolf River, Doniphan, Kansas Territory; Roll: M653_347; Page: 0; Image: 405. Daughter Christina married a John White. They also resided in Doniphan. Source Citation: Year: 1870; Census Place: Iowa, Doniphan, Kansas; Roll M593_432; Page: 93; Image: 188.
next household Sarah Robbins etc. John Heaston married Frances Firebaugh and moved onto the Reserve, then Falls City, Richardson, Nebraska. Elizabeth Heaston married John Miller and can be seen in the 1870 and 1880 census in the household of her father. Sarah Heaston married William J. Rittentour in 1858 and can be seen in the 1860 and 1870 censuses above. Francis Jane Heaston married William Pry. Source Citation: Year: 1870; Census Place: Wolf River, Doniphan, Kansas; Roll: M593_432; Page: 215; Image: 432. Benjamin Franklin Heaston married Sarah Archer. Source Citation: Year: 1870; Census Place: Wolf River, Doniphan, Kansas; Roll: M593_432; Page: 215; Image: 433. Thank you! I was happy to find this post. I am a descendant of Elizabeth Heaston and John Miller.